Tri City Sign Company is a major manufacturer of signage for various businesses nationwide and we install signs throughout the Midwest United States. We co-ordinate turnkey installations nationwide. Tri City Sign is an approved vendor for AmericInn International, LLC which is AmericInn Lodge & Suites. We also manufacture for Bass Properties under a limited license agreement. Tri City Sign produces innovative signage for an ever changing business world. Just as your company image is personal to product and service, Tri City Sign has relied on a personal approach to sign manufacturing and service to our clients. 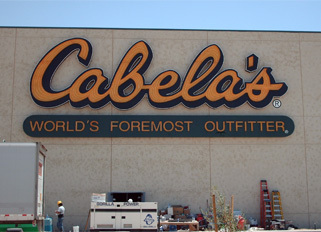 Tri CIty Sign Company recently manufactured and installed all of the signs for Cabela's new location in Glendale, AZ. 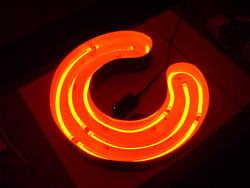 Shown at the right is a set of 15'-0" tall channel letters. The letters span out over 50'-0", and over one mile of neon was used to create these letters. To see the rest of the signs for this and other Cabela's locations check out our portfolio.